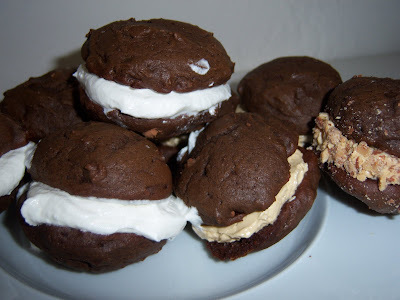 This may shock anyone from the Northeast - but I'd never even heard of a Whoopie Pie until I was almost 30. I had one at a company potluck and immediately asked my colleague for the recipe, which she kindly have me - and which I filed away and never made. Now, my colleagues at Chronicle Books are coming out with a fabulous new cookbook dedicated to these wonderful little treats. 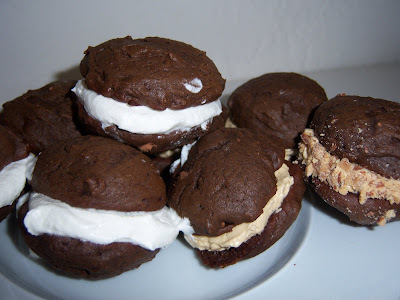 Whoopie Pies has dozens of recipes for cookie-cakes and fillings that you can mix and match in any way you like - there's even savory pies for your next cocktail party! There's been so much talk about Whoopie Pies over the last few months that I knew I'd be making some sooner or later - and today was the sooner. They baked up like little dreams - I filled some with the coffee buttercream, some with the vanilla meringue buttercream, and rolled some of the coffee ones in a mix of almonds and toffee bits. They taste - awesome! The cookie-cakes are not too sweet, and have a wonderful texture. And unlike their trendy cousin the cupcake, you get a perfect cake to frosting ratio in every easy-to-eat bite. The recipe calls for sifting the dry ingredients. I skipped that step, but shouldn't have - there were a few little clumps of flour in the cookies. You can spoon out the batter onto the pan, or use a pastry bag. When I make these again I'll either use a pastry bag or flatten the batter a big so the baked cakey-cookies are a little shorter and easier to eat without stretching your mouth. I'm usually not a huge fan of powdered sugar-based frostings, so I made a 1/2 batch of Italian Meringue Buttercream from A Field Guide to Cupcakes, which was tasty - but too soft, it squishes out the side when you bit in a little more than I'd like. Rose Levy Berenbaum's version in The Cake Bible is a firmer (if I remember right, I haven't made it for a while) and ganches, and egg yolk-or cream-cheese based frostings would work much better. Here's Sarah Billingsley and Amy Treadwell's recipe for Mocha Whoopie Pies from their upcoming book: Whoopie Pies Dozens of Mix 'em, Match 'em, Eat 'em Up Recipes! Position a rack in the center of the oven and preheat the oven to 375ºF. Line two baking sheets with parchment paper. 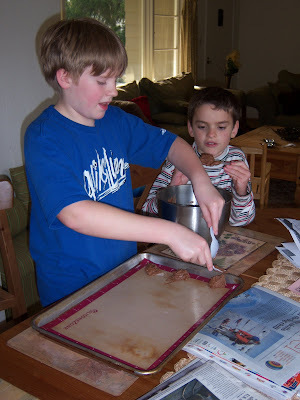 Sift together the flour, cocoa powder, baking soda, and salt onto a sheet of waxed paper. In the work bowl of a stand mixer fitted with the paddle attachment, beat together the butter, shortening, and brown sugar on low speed until just combined. Increase the speed to medium and beat until fluffy and smooth, about 3 minutes. Add the egg and vanilla and beat for another 2 minutes. Add half of the flour mixture and half of the milk and beat on low until just incorporated. Scrape down the sides of the bowl. Add the espresso-water mixture and the remaining flour mixture and milk and beat until completely combined. Using a spoon, drop about 1 tablespoon of batter onto one of the prepared baking sheets and repeat, spacing them at least 2 inches apart. Bake one sheet at a time for about 10 minutes each, or until the cakes spring back when touched. Remove the baking sheet from the oven and let the cakes cool in the pan for about 10 minutes before transferring them to a rack to cool completely. Fill with buttercream filing (below). 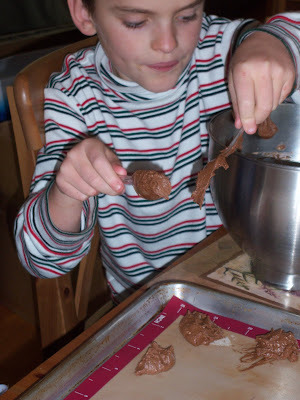 In the work bowl of a stand mixer fitting with the paddle attachment, beat together the confectioners’ sugar with the butter, starting on low and increasing to medium speed, until the mixture is crumbly, about 1 minute. Add the heavy cream, vanilla, and salt and beat on high speed until smooth, about 3 minutes.